If you want more storage, want it faster and want it smaller, Angelbird’s portable SSDs might be just the thing. We take a look at how the iPad Air 2 deals with music software. Arturia’s Beatstep combines a MIDI controller and a step sequencer in one extremely reasonably priced box. Audiowiesel are a small fledgling company run by Austrian composers Frank Herrlinger and Daniel Szwedek. Can Chandler pack all of the EMI/Abbey Road sound for which they’re so famous into a single-module 500–series preamp? The depth and complexity of the Pro 2 could make it Dave Smith’s most sophisticated monosynth yet. Dynacord apply their typically thoughtful design to a compact desk, which could be just the ticket for small gigs and installations. If you want to create convincing keyboard parts but don’t have the playing chops, AutoTheory might save your bacon. Formerly sold under the SE brand, these Andy Munro–designed Egg speakers have been given a major update. So what’s new? Like its predecessor Action Strings, the Action Strikes percussion library is a collaboration between software giants Native Instruments and the production company Sonuscore. NI turn their hybrid expertise to keyboard design with an innovative controller for Komplete and Maschine. The Signature Three offers something no other EQ does — four inductor-based bands per channel. Can this tiny box deliver a big sound? 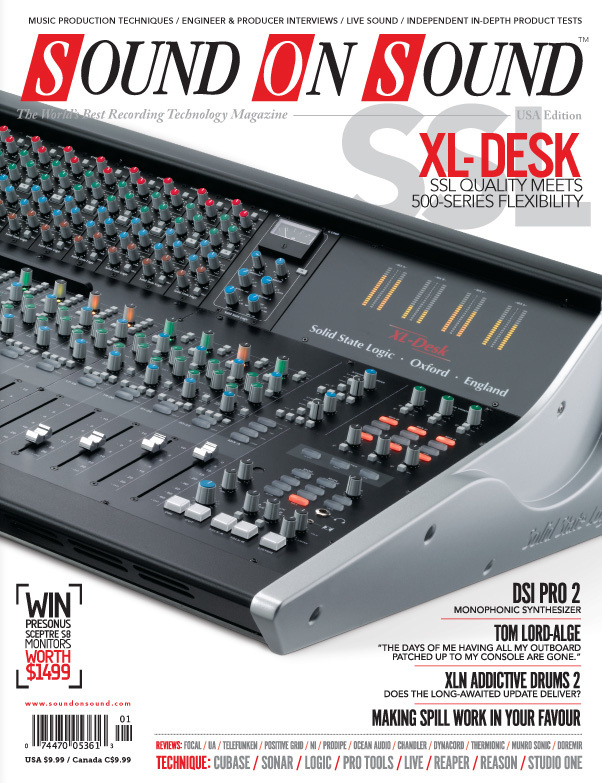 This month XILS Lab 'XILS4' and Digital Brain's 'Multiplex Vocoder'. With component-level adjustment and ‘amp matching’ features, BIAS can target almost any guitar amp sound — real or imagined! This extensive and in-depth eBook explains so much more than how to process your kicks and bass sounds! Douglas Self’s excellent technical reference book for solid-state audio-gear designers has been updated. A couple of years ago Sonokinetic released Carousel, a rather splendid Kontakt–hosted fairground organ. The Carnival is very much a ‘sister’ instrument to Carousel and presents two smaller-scale barrel organs. Could this crafty three-in-one PA and lighting system save you both time and money? Renowned microphone brand Telefunken tackle the drum-mic kit market, with this high-end collection of dynamic models. With its parallel inputs, Thermionic Culture’s valve-based channel strip enables all sorts of creative recording options. And it sounds great, too! UA’s emulation of the AMS digital reverb shows exactly why the original is still regarded as a classic. It’s been a long time coming, but the follow up to XLN’s Addictive Drums was worth the wait. Zero–G’s Electro Cinematic library provides approximately 2.5GB of sample material. Get to grips with Reaper’s range of automation facilities. For this ambitious project, John Crossley had a full live band play through a 16-speaker system, to create an immersive performance. If you’re in search of novel effects in Studio One, fire up the Autofilter plug-in! Here's how to set up your own hardware–controlled channel strip in Cubase. We look at ReGroove and the new quantise features in Reason 8. This page contains a directory of all media pages related to the January 2015 articles. Max Farrar: we take on a well–crafted contemporary pop tune with a massive number of tracks, and create two different mixes. Become a Sonar ninja with these time-saving tips. Pro Tools acting funny? Chances are you’ve just changed playback mode by accident. Learn how to create vocal harmony parts and doubling effects using Flex Pitch and Logic’s vocoder plug–in. Brushes Held Like Hammers: Our recording engineer looks at ways to reduce spill without compromising a full–band tracking session. We get plucky with Ableton Live’s Tension instrument. Paul and Hugh head off to The Cave! Team SOS travel to deepest, darkest Cornwall, where they encounter some troublesome low frequencies and tackle a few common mix quandaries. This month's tracks from Clean Bandit, Oliver Heldens, Meghan Trainor, Barbra Streisand and our Classic Mix Bill Haley & His Comets Rock Around The Clock. Mix engineer David Wrench has the rare ability to bring discipline to experimental projects, without losing their leftfield qualities. For Rivers Cuomo and Weezer, going back to basics meant a reunion with one of the biggest names in rock mixing: Tom Lord-Alge. This month we listen to Easychair, Man Bites Zombie, Lukas Creswell-Rost and Lunacybot. What's The Future Of Mastering? I could swear that we now have at least three Christmases a year! It’s hard to make something new. It’s even harder to make something that’s both new and old. Despite a recent downturn, the video–game industry still has much to offer to audio pros. Sweden’s newest high-end studio is built on very strong foundations, both literally and metaphorically. Media content for the January 2015 issue.